This slipper chair looked great before the slipcover but because it sits in a sunroom with lots of sun, the once bright yellow fabric had turned more of a mustard color. My client loves yellow and found a beautiful fabric from Fabrics.com that is rated to withstand 1000 hours of sunlight. Since it is an indoor/outdoor fabric I didn’t prewash it to preserve the protective features of this fabric. To avoid the original fabric from showing through, I made a snug white slip for the chair. 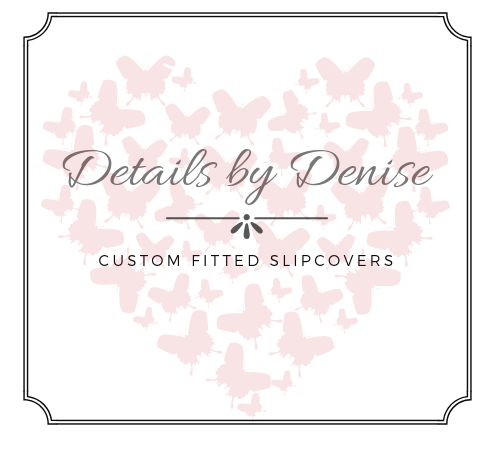 I decided on a separate slip as opposed to a lined slipcover so if she decides to make another slipcover the chair she will not have to worry about any fabric showing through and won’t have to go through the expense of a new lining. She wanted a short box pleat and covered buttons on the back to change-up the style. I also made a matching rectangular pillow for her to use either on the chair or to coordinate in her room. It features an envelope style back for easy on and off. I think it turned out great and dresses up the chair just enough. Coming Up: After ordering many samples of outdoor fabric for my own patio set I finally decided on a beautiful red fabric (Solarium Rave Cherry to be exact) from JoAnn’s at 60% off! With ten cushions to redo, that’s quite a savings! I’m really looking forward to the fresh clean cushions for our front porch at the lake house. I am also working on a cool couch and chair redo for a client who has two small kids and two small dogs. Slipcovers are a necessity! The warm weather tease we’ve had over the last few weeks has us all antsy and thinking about spring. Now is the perfect time to update your patio furniture cushions. Email or call me for an estimate.